On Sunday, June 28, undergraduate and graduate students from Minneapolis and Rochester will celebrate their graduation from Augsburg College. 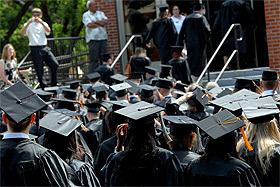 For a complete listing of events, go to www.augsburg.edu/commencement. As in the May commencement ceremony, both the featured speaker and honorary degree recipient are well known for their distinguished careers related to science and education.